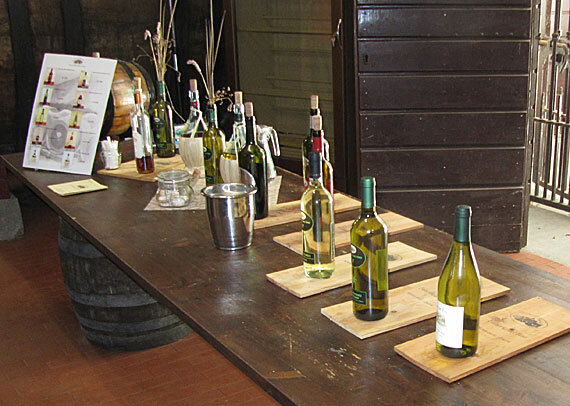 Nothing like a bit of necessity to help you discover a new surprise in Tuscany! A dear friend from high school drops in with his (entire) family…and where am I going to take them? His brother-in-law wants Pisa, his parents prefer not to walk too much, his sister loves small towns, his nephew is curious to do some (serious) wine tasting and my friend…he just wants to relax and not be responsible for … anything. Is it even possible to satisfy them all in one afternoon? The challenge was on – and I do love a good challenge!! I couldn’t have them start this day off without have a look at one of the most perfect sites in Florence. Therefore first things first, when we left Florence we took in an early morning view of the skyline, including Palazzo Vecchio and the Duomo at the still quiet Piazzale Michelangelo. And since it is a personal favorite on mine, I had the driver (wonderfully patient man!!) take us up to San Minato to enjoy the view from there and admire the incredibly beautiful facade from the car. My objective was to get in and out of Pisa early in the morning to avoid long lines and ensure the best photo opportunities. For those with just a little more time and let’s face it stamina for all 296 steps and 6° slant to the south, it is highly suggested to book tickets in advance for the tower so that you don’t have to wait for your entrance and lose the time just “hanging”. 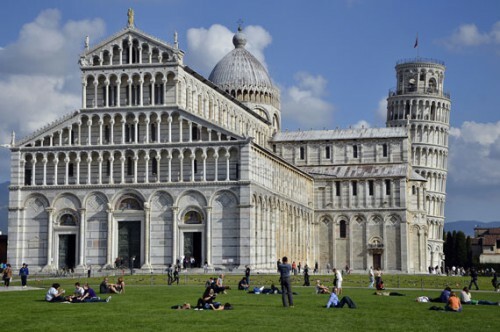 You can easily plan an hour just enjoying the incredible views in Piazza dei Miracoli and why not, lots of wonderful photo opportunities (yes that would include the typical “holding the tower up” – too silly for words). Even with two wheelchairs in tow, the Square was easy to navigate with several ramps up and down the external marble steps bordering the Cathedral, the Baptistry and the Camposanto walls. It definitely helped that we had a private driver – who parked the car practically in the shadow of the Tower; this authorized only parking made it a breeze to unload, walk around and pop out all under an hour. Next stop was Lucca, a panoramic 30 minute trip in the car climbing the “hill” that separates Pisa and Lucca to quickly slide right into Piazza Napoleone. Again, the wheelchairs were (fairly) easy to use here. Yes, there are several cobbled stone streets but they are in good condition and maneuvering the streets was no stress – especially nice were the availability of public bathrooms – clean and accommodating for those with mobility issues. 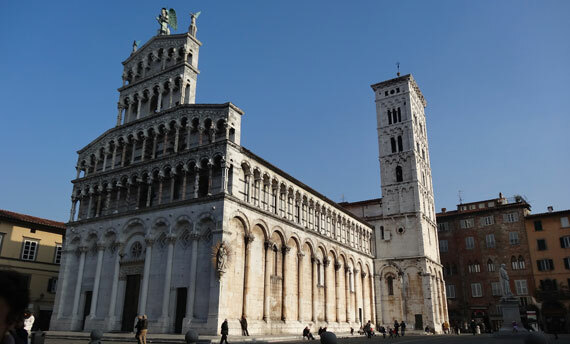 Our time here included a stroll thru the almost sleepy streets of Lucca, to see the Duomo, the shops, picturesque cafes and even bit of the walls. Perhaps we were a bit fast but it didn’t diminish the pleasure of being surprised at every corner with yet another architectural beauty. 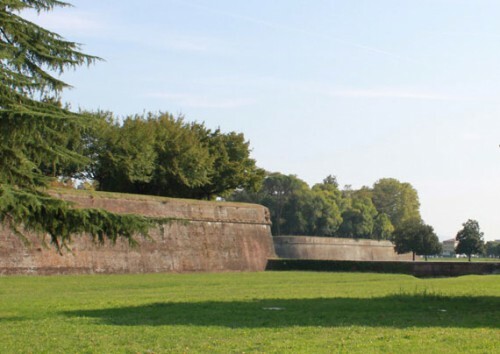 We enjoyed a leisurely pace and were able to appreciate the atmosphere of Lucca – warm, friendly and authentic. Once again our driver, Simone, proved to be worth his weight in gold; a private driver was the key to a prime spot for us to load and unload without wasting any of our precious time. 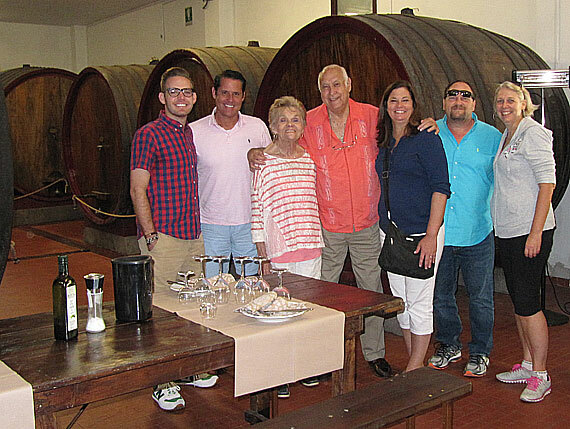 Immediately we were caught up in the excitement of discovering the flavours of Montecarlo, the wine region of Lucca. Samanta invited us to sit down in a huge cantina surrounded by more than 50 wooden “botte” , where we had the opportunity to appreciate the aromatic extra virgin olive oil, the rich and subtle flavors of 4 wines, vin santo (and for the more courageous a grappa). She took her time to carefully explain the characteristics of each wine and the selection of exceptional local suppliers of salumi, cheese and pasta. Among the explanations of how, why and what we were eating (and of course drinking!) we settled into the fun of the experience, unwinding a bit from the time on the road and the early morning wake-up call. By the end of the meal we had selected our favorite bottles to take home, made friends with the newlyweds at the table next to ours and made new friends with Samanta and Laura, our hostesses. At the end of the day the vote was definitely all thumbs up! We covered everything and didn’t leave anyone behind. A special thanks to my travelling companions who made it all the more fun!